With ever increasing options on bike riding and cycle routes in Glencoe and surrounding area our web pages on Mountain Biking have now moved to their own dedicated section of our GlencoeScotland web site. For more information about Mountain Biking and Cycle Routes please follow this link to our Mountain Bike Web Page. The Devil's Staircase - the classic descent over the West Highland Way, with the opportunity to link this ride into the Ciaran Path from the Blackwater Dam to Kinlochleven. Local Forests - In addtion to simply riding forest roads, many of the local forests such as Glencoe, Brecklet, Inchree and Duror, are home to an illicit network of hand made trails. The Blackwater Dam & Ciaran Path - Proper mountain biking in superb Highland scenery above the village of Kinlochleven. Glen Duror to Ballachulish - A less well known and quite technical ride over a small pass, with a link back on the cycle track. Lochaline Rides - Less explored and wonderfully quiet, the Post Route from Drimnin is classic Highland biking. 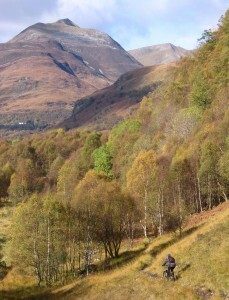 Glencoe Mountain - Summer season uplift for the black and red graded downhill tracks. Away from the main roads there are some excellent opportunities for cycling in the Glencoe area. 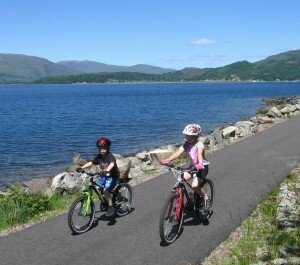 From family excursions by the sea along the Sustrans cycle path, to grueling ascents in the splendid Highland scenery, there is something for every cyclist. Round Loch Leven - a pleasant 20 mile tour round Loch Leven on quiet roads and cycle track. Port Appin Loop - A 15 mile loop close to the iconic Castle Stalker, on the Sustrans cycle track and single track roads. The Cycle Track to Oban - As the route develops, this section of cycle track is a delight for recreational cyclists. CrankItUp Gear offers bike hire along with some maintenance and sales in Glencoe village. Pre-booking is advised. If you're heading to Fort William and looking for bike hire or a fully stocked bike shop then pop into Nevis Cycles. Nevis Cycles is based a short distance from the town centre and also has a seasonal base at Nevis Range. Also Off Beat Bikes has reopened on the High Street. They were the original shop on the high street and had a big part in developing mountain biking into what it is today in Fort William and Lochaber. Clachaig Inn offers bike storage facilities, as well as a work bench and a few tools should you need to make a few running repairs, a service which is also available to guests of Clachaig Holidays. Clachaig is also recognised by VisitScotland’s ‘Cyclist’s Welcome’ Scheme.